Twitter is a fount of wisdom, you should watch the valuable account. Thanks to Chris Wahl one entry about storage letancy control, my life has improved considerably. With surprise because I discovered that despite the fact that I use quite a long time Veeam Backup and move through it with considerable skill. I never walked in the “options” of the program (because why)! We have a Enterprise version, is the backups be performed ok or not ok, I control from the vSphere Web Client and Veeam Backup Enterprise Manager (and sometimes I look directly into the program). Does this work? 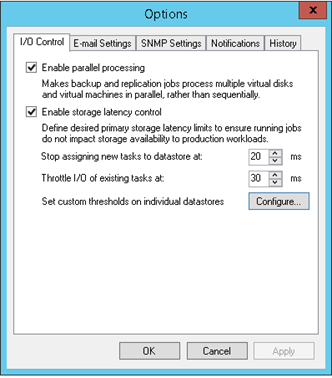 Below the disk load during incremental backup of six virtual machines. iSCSI disk mounted from the Synology NAS. How do you see the delay in the record are kept in check. Exactly the same behavior observed in the performance of bulk copy of our production environment. What is the conclusion? Man learns life and it’s worth the time to refresh their habits (EMC Avamar such an option was not)!